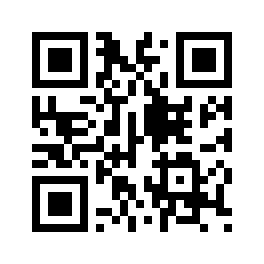 This recipe is from 'Veggie' by Dan Toombs aka The Curry Guy. 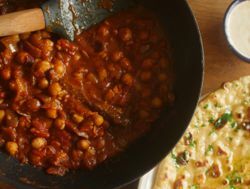 Dan is an American living in Yorkshire and cooking British Indian Restaurant recipes. I've been a fan of his for a while and was pleasantly surprised when his book dropped through my letterbox! 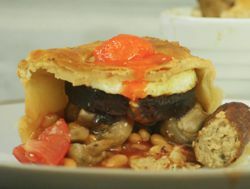 I wouldn't say an English breakfast in a pie is the Holy Grail of the pie-maker's art, but it's certainly challenging. 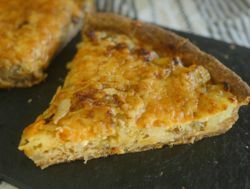 You have a bunch of elements, some wet, some dry and one of them runny, and for most of them, being baked in a pie isn't the best way to cook them. But it's always fun to try. Did you know rhubarb is actually a vegetable? 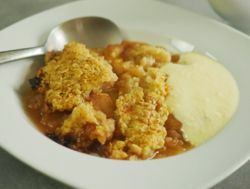 Well it is, and it is utterly wonderful in a crumble. Maincrop rhubarb is available in the summer and autumn, but if you're lucky, you might be able to get your hands on Yorkshire forced rhubarb in February/March - a very special treat! This recipe uses both rhubarb and apple, but you could leave out either if you wish. If you're only using rhubarb, you might want to add more sugar to the filling. A good scone should be light, fluffy and well-risen. 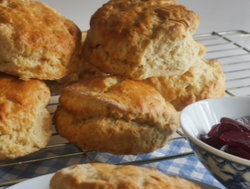 With this recipe, your scones will never turn out like biscuits again! Jams and preserves have been made for centuries as a way of preserving excess soft fruit. 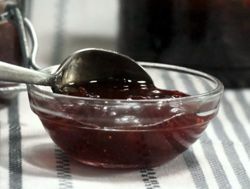 Frequently, shop-bought jam contains much more sugar than fruit, but if you make your own, you know exactly what's in it. Homemade jam is quite easy and quick - you can easily make a small batch in about half an hour. 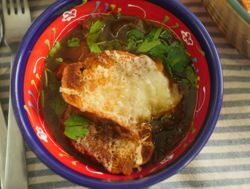 French Onion Soup, or Soupe à l'Oignon Gratinée has been around in France since the 18th Century, but became popular in the US and UK in the 1960s. 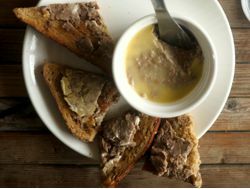 The croute on top soaks up some of the some and gives it body, but the key to a wonderful soup is a fantastic beef stock. 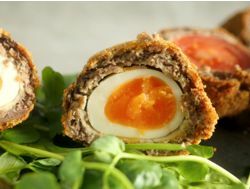 The traditional Scotch egg doesn't have much of a connection with Scotland - it was invented in London by Fortnum & Mason. 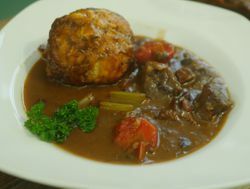 But you can make it more Scottish by adding some haggis to the sausagemeat. Another variation is the Manchester Egg - a pickled egg wrapped in black pudding. 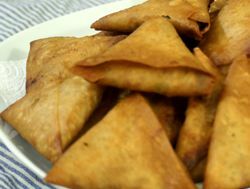 Samosas are a delicious little Indian snack. These are mildly curry-flavoured, and I promise you, you won't be able to just eat one! 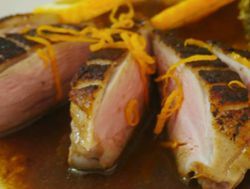 The French call it canard a l'orange, English speakers will call it duck with orange sauce or, if they're feeling exotic, duck a l'orange. 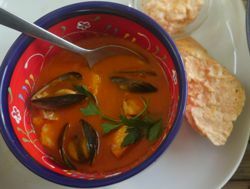 This simple but tasty dish became massively popular outside France in the sixties and seventies. I'm using sous vide to cook my duck breasts because it gives incredibly tender meat. 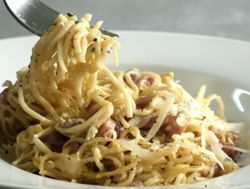 Spaghetti Carbonara must be one of the easiest and quickest Italian pasta dishes to make. With only a handful of ingredients, you can have a delicious and filling dish on the table in only 15 minutes! Eggnog is thought to have evolved from posset in the 13th Century. Egg nog is very popular in the US and Canada, but less so in the UK. 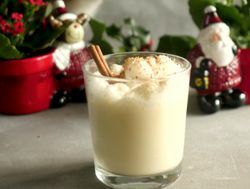 Eggnog is very easy to make and tastes delicious - it's almost like an alcoholic custard made from eggs, milk, cream and dark spritis such as rum, brandy or Bourbon.